But not in that order. E-commerce is driving out retailers, and boomers are aging—so here come the doctors. The Runway at Playa Vista in Los Angeles recently added a Whole Foods, a movie theater, and upscale shops and restaurants—retail center staples intended to attract affluent shoppers, condo-buyers, and tech companies to the mixed-use development. The next big tenant slated to move in, however, is a little different: A 32,000-square-foot doctors' office, where the Cedars-Sinai Health System plans to house outpatient services, including cardiology and orthopedics. While urgent-care centers have been strip-mall staples for decades, the chance to catch dinner, a movie, and a surgical procedure under the same roof is new—and coming soon to a mall near you. The reason is commerce: Mall operators are looking for tenants that trade in entertainment and services to replace the brick-and-mortar retailers slowly being strangled by Amazon.com and its online competitors. Rents, particularly at older malls, are a bargain. The health-care industry, meanwhile, is moving away from centralized campuses to bring services closer to patients at a time when two key demographics are entering prime years for consumption. Boomers are hitting an age when they can expect to use more health-care services; millennials are starting families and beginning to make doctors appointments for their kids. Put those factors together, and voila: You can get your blood pressure checked just steps from the steakhouse. Gauging just how rapidly health-care companies are absorbing retail space is difficult, because the industry is composed of regional and local players, many of which are using only small amounts of space. CoStar, a commercial real estate data and analytics firm, has begun tracking health-care companies as retail tenants only in recent years, making it hard to measure the industry's footprint. But the consensus among observers is that it's the wave of the future. Cedars-Sinai isn’t the only health-care provider to take a large space in a retail mall. Others include the Prime Healthcare, which operates a 23,500-square-foot ambulatory care facility at the Plymouth Meeting Mall outside Philadelphia. Last year, UCLA Health put a dozen doctors in a new medical office at the Village at Westfield Topanga, a high-end mall in Woodland Hills, Calif.
Then there's Vanderbilt University Medical Group, which occupies the entire second level at the 100 Oaks Mall in Nashville, Tenn., where patients can pick up a pager when they check in at a clinic, then browse the outlet shops on the lower level while they wait. It used to be that only restaurants would give you a pager to let you know when your table was ready. Now it means the results of your CT scan are in. As this transformation has begun to take shape, strip malls seem to be more popular than traditional malls because they offer medical tenants an appealing prospect: parking spaces directly in front of their stores so the elderly and infirm don’t need to cover large distances, let alone navigate stairs or escalators. 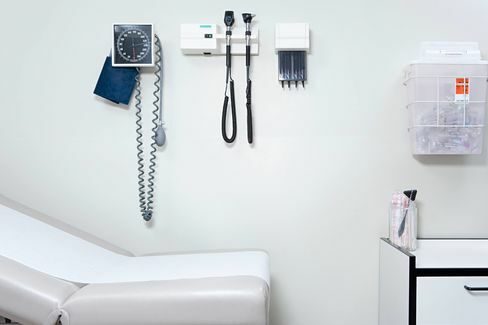 While outpatient facilities and doctors offices make the move from hospitals and medical suites to the mall, about one-third of the 7,200 urgent-care centers in the U.S. are already there, said Steve Sellars, president of the Urgent Care Association of America. The industry is adding a few hundred new urgent-care centers a year, leading operators to try out new locations. Care Here!, a Brentwood, Tenn.-based health and wellness company, even opened a walk-in clinic in the Nashville airport. For the health-care companies, softness in the retail market has helped them negotiate favorable leases, including improvement allowances. Medical facilities also look good financially as tenants, with credit profiles that stack up well compared with nail salons and fast-food restaurants. Still, there's a learning curve on both sides, said Sarah Bader, leader of the global health and wellness practice at the architecture firm Gensler. Many landlords are still coming to grips with the idea that medical clinics won't scare off other businesses. And health-care companies are just learning how to use retail space to build stronger relationships with their customers. "When you go to Starbucks, you know it’s a Starbucks," she said. "It's been a challenge, because health-care systems aren't particularly brand-savvy clients." Bader has been working with such companies as Chicago's Northwestern Memorial Hospital to create a design manifesto for its growing retail footprint. "You want people to know that whether they’re having an operation or going to the pediatrician, they’re in the same health system."